PYP1: Engineered for Learning- The importance of guest speakers. Last Friday, Mr. Hayek came to class to give us our first ever lesson in engineering and architecture. We are exploring different kinds of shelters across the world and thought it would be interesting to find out how a house is actually built. 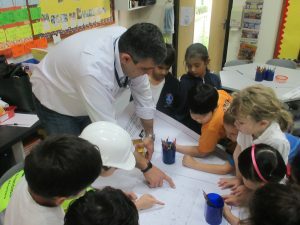 We invited Mr. Hayek, an engineer by profession, to share his knowledge with us and tell us all about building houses, the people involved and the amazing features we can incorporate in our houses to make them more eco-friendly. Mr. Hayek took us through a presentation which showed us the step by step procedure involved in constructing a house, starting with a family’s need for shelter and ending with a wonderful place to call ‘home’. We learned that while the builder constructs the house but it is the engineer and the architect who first carefully plan the details and collaborate with other people such as the landscaper and the decorator to design and beautify the house. We saw how the different spaces in the house are designed and had a first hand experience of fixing these areas onto a cardboard house layout. It was kind of like putting a puzzle together. 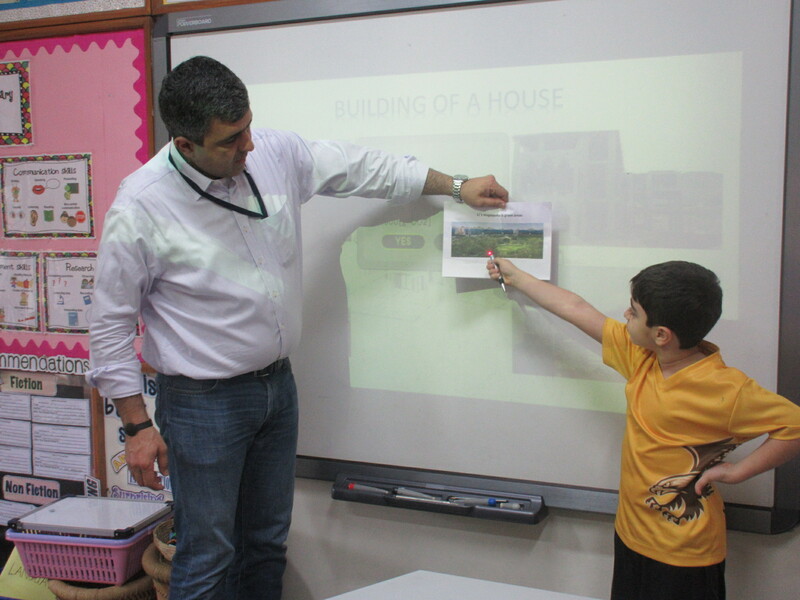 Mr. Hayek then introduced us to some amazing features which can help make our shelters more environmentally friendly. We saw how double-glazed windows and double layered walls act as good insulators to keep out undesirable weather. We learnt about the working of wind turbines and solar panels and their role in generating electricity. We also heard how ventilation is important to ensure enough oxygen flows into our houses. Mr. Hayek generously left us loads of real plans for real houses so that we can explore all the fine detailing and the tremendous work that goes into designing a house. At the end of this fascinating session, Michel joined his father and made a very interesting presentation on his own home in Magarpatta, revealing how he, his family and the members of his society have contributed towards making their living space more ecological and healthy. We discovered how simple acts such as separating our wet and dry trash, installing a solar panel or maybe just having more plants around, can make a difference to our environment and eventually, to our planet Earth.